Wie funktioniert der AGE Reader? Skin autofluorescence predicts major adverse cardiovascular events in patients with type 1 diabetes: a 7-year follow up. Blanc-Bisson C. et al. Cardiovascular Diabetology. 2018 June 8; 17:82. doi: 10.1186/s12933-018-0718-8. Association between Self-reported Physical Activity and Skin Autofluorescence, a market of Tissue Accumulation of Advanced Glycation End Products in Adults with Type 1 Diabetes: A Cross-sectional study. Duda-Sobczac A. et al. Clinical Therapeutics. 2018 June;40(6):872-880. doi: 10.1016/j.clinthera.2018.02.016. Epub 2018 Mar 19. Skin autofluorescence, a non-invasive biomarker for advanced glycation end products, is not related to the number of pregnancies. van Waateringe R.P. et al. Journal of Diabetes; 2018 May 17; doi: 10.1111/1753-0407.12782. Subcutaneous advanced glycation end-products and lung function according to glucose abnormalities: The ILERVAS Project. Sanchez E. et al. Diabetes & Metabolism. 2018 April 13. doi: 10.1016/j.diabet.2018.04.002. Autofluorescence of Skin Advanced Glycation End Products as a Risk Factor for Open Angle Glaucoma: The ALIENOR Study. Schweitzer C. et al. Invest Ophthalmol Vis Sci. 2018 Jan 1;59(1):75-84. Association of advanced glycation end products, evaluated by skin autofluorescence, with lifestyle habits in a general Japanese population. Isami et al. J Int Med Res. 2018 Jan 1:300060517736914. doi:10.1177/0300060517736914. Skin accumulation of advanced glycation end products is increased in patients with an abdominal aortic aneurysm. Boersema J et al. J Vasc Surg. 2017 Dec;66(6):1696-1703.e1. doi: 10.1016/j.jvs.2017.04.037. Skin Autofluorescence is a Noninvasive Surrogate Marker for Diabetic Microvascular Complications and Carotid Intima-Media Thickness in Japanese Patients with Type 2 Diabetes: A Cross-sectional Study. Yoshioka K. Diabetes Ther. 2017 Nov 24. doi: 10.1007/s13300-017-0339-3. Association Between Accumulation of Advanced Glycation End-Products and Hearing Impairment in Community-Dwelling Older People: A Cross-Sectional Sukagawa Study. Niihata K. et al. J Am Med Dir Assoc. 2017 Nov 1. pii: S1525-8610(17)30520-0. doi: 10.1016/j.jamda.2017.09.008. Skin autofluorescence improves the Finnish Diabetes Risk Score in the detection of diabetes in a large population-based cohort: The LifeLines Cohort Study. Fokkens B.T. et al. Diabetes Metab. 2017 Oct 30. pii: S1262-3636(17)30513-X. doi: 10.1016/j.diabet.2017.09.002. Accumulation of advanced glycation end products evaluated by skin autofluorescence and incident frailty in older adults from the Bordeaux Three-City cohort. Pilleron S. et al. PLoS One. 2017 Oct 17;12(10):e0186087. Progression of skin autofluorescence of AGEs over 4 years in patients with type 1 diabetes. Rajaobelina K et al. Diabetes Metab Res Rev. 2017 Oct;33(7). doi: 10.1002/dmrr.2917. Ethnicity and skin autofluorescence-based risk-engines for cardiovascular disease and diabetes mellitus. Ahmad M.S. et al. PLoS One. 2017 Sep 20;12(9):e0185175. Advanced glycation end-products (AGEs) accumulation in skin: relations with chronic kidney disease-mineral and bone disorder. França R.A. et al. J Bras Nefrol. 2017 Jul-Sep;39(3):253-260. Advanced glycation end-products (AGEs) and associations with cardio-metabolic, lifestyle, and dietary factors in a general population: the NQplus study. Botros N. et al. Diabetes Metab Res Rev. 2017 Jul;33(5). Association between habitual dietary and lifestyle behaviours and skin autofluorescence (SAF), a marker of tissue accumulation of advanced glycation endproducts (AGEs), in healthy adults. Kellow N.J. et al. Eur J Nutr. 2017 Jun 27. doi: 10.1007/s00394-017-1495-y. Re: Skin Autofluorescence (a Marker for Advanced Glycation End Products) and Erectile Dysfunction in Diabetes. Seftel A.D. et al. J Urol. 2017 Jun;197(6):1533-1535. The relationship between circulating irisin levels and tissues AGE accumulation in type 2 diabetes patients. Li Z. et al. Biosci Rep. 2017 Jun 8;37(3). Skin autofluorescence is associated with arterial stiffness and insulin level in endurance runners and healthy controls – Effects of aging and endurance exercise. Couppé C. et al. Exp Gerontol. 2017 May;91:9-14. Advanced glycation end-products are a risk for muscle weakness in Japanese patients with type 1 diabetes. Mori H. et al. J Diabetes Investig. 2017 May;8(3):377-382. Skin autofluorescence, a non-invasive marker of advanced glycation end products: clinical relevance and limitations. Da Moura Semedo C. et al. Postgrad Med J. 2017 May;93(1099):289-294. Relationship between advanced glycation end-product accumulation and low skeletal muscle mass in Japanese men and women. Kato M. et al. Geriatr Gerontol Int. 2017 May;17(5):785-790. Skin autofluorescence, a non-invasive biomarker for advanced glycation end products, is associated with the metabolic syndrome and its individual components. van Waateringe R.P. et al. Diabetol Metab Syndr. 2017 May 30;9:42. Advanced Glycation End Products in Recent-Onset Psychosis Indicate Early Onset of Cardiovascular Risk. Hagen J.M. et al. J Clin Psychiatry. 2017 Apr 25. doi: 10.4088/JCP.16m10972. Higher skin autofluorescence in young people with Type 1 diabetes and microvascular complications. Cho Y.H. et al. Diabet Med. 2017 Apr;34(4):543-550. Diverging effects of diabetes mellitus in patients with peripheral artery disease and abdominal aortic aneurysm and the role of advanced glycation end-products: ARTERY study – protocol for a multicentre cross-sectional study. de Vos L.C. et al. BMJ Open. 2017 Apr 11;7(4):e012584. Vitreous advanced glycation endproducts and α-dicarbonyls in retinal detachment patients with type 2 diabetes mellitus and non-diabetic controls. Fokkens B.T. et al. PLoS One. 2017 Mar 6;12(3):e0173379. Sind Sie an einem White Paper oder einer Produktbroschüre interessiert? Bitte hinterlassen Sie Ihren Namen und Ihre E-Mail-Adresse hier. Möchten Sie mehr über unsere Produkte erfahren? Fordern Sie alle Informationen an, die Sie hier erhalten möchten. Mit der neuen AGE Reader App können Sie einen umfassenden kardiovaskulären Risikobericht basierend auf der Messung des AGE Reader erstellen. Für jeden Patienten können alle Besuche in der bedienerfreundlichen App dokumentiert und hinzugezogen werden. 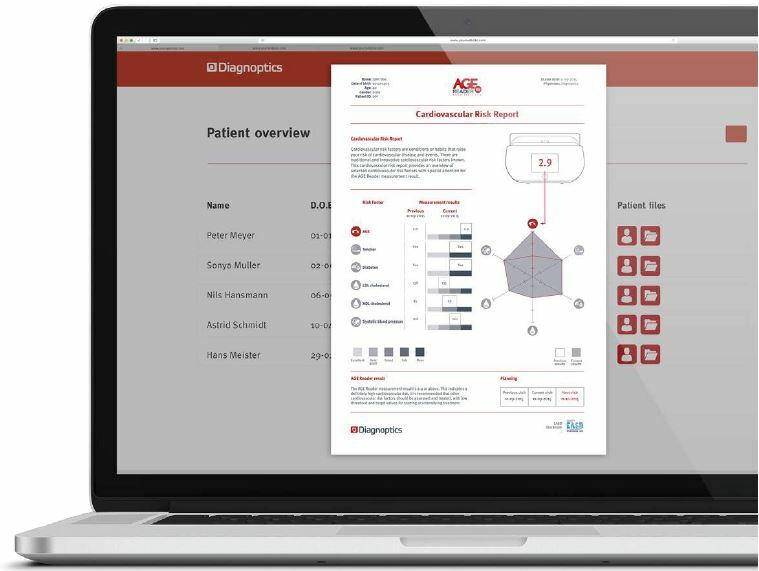 Informationen über Produkte von Diagnoptics und Advanced Glycation Endproducts.